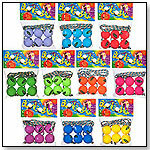 This set includes four complete BlongoBall games and is a great package for entertaining large groups. It accommodates 16 players. To add more teams, players can order more BlongoBall Accessory Packs — one pack per player or team. This is a handy little ditty bag that can be used to store BlongoBalls. It is 11.5" by 8". With this nifty carrying case, Blongo can go anywhere. It is a Nylon Mesh Bag with a Shoulder Strap. It's 17" by 33". Up to 10 players can play. They can order one set of BlongoBalls for each additional player or team. BlongoBall is a great family game on the beach, at a picnic, on a camping trip, indoors or outdoors. Toss the unique BlongoBalls and wrap them around a horizontal bar to score points. Fun for all ages and skill levels. 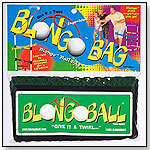 BlongoBall is easy to learn, exciting to play and will be enjoyed by the entire family for years to come. This Toss It, Wrap It and ScoreGame consists of two BlonGoals (racks) and two sets of BlongoBalls (yellow and orange) — enough for two players or two teams. Each of the two goals is 24”W x 26 ½”L x 39 ½”H and made of PVC. Ball sets include six balls of 1.625” in diameter. The toy is made of plastic, surlyn and nylon rope.